I spend about 10 weeks a year in Paris, and something I do often is to take cooking lessons, almost exclusively at Atelier des Chefs. This school offers single hands-on lessons of between 30 minutes (prepare and eat lunch for 18 euros) and two hours. There are currently five locations in Paris, five in the rest of France, and also in Brussels, Dubai and London. I almost always take the two-hour "tradition" course and try to do it at the biggest atelier, on rue de Penthièvre (8ème), which happens to be near to my apartment. The maximum number of students at this location is sixteen, but generally there are between eight and twelve. The class breaks down into groups of three or four, depending on the total number, and each group makes every dish that is being taught, after a brief demonstration by the chef. Usually there are three or four dishes, based on a theme, such as my most recent class on crêpes (suzettes; roulées ganache framboisée; soufflées à la crème chibouste). I have taken courses on such diverse themes as cod, salmon, chocolate, potatoes, caramel, goat cheese, foie gras, macarons, etc. The chefs are generally excellent, and the recipes can really be made at home; quite a number have entered into my repertoire. Lessons are announced 30 days in advance and may be booked only on the Internet, at www.atelierdeschefs.com. The lunch lessons sell out instantly, so stay up late 30 days in advance if you are interested. Warning: the lessons are in French and go pretty quickly; you can't fake it. If you don't speak good French, go with someone who does. Back to Paris, where my favorite pâtisserie, Dalloyau, has a window consecrated to my favorite pastry, macarons. A long way from the spa . . .
My wife and I are just back from a week at the famous Rancho la Puerta, a 60-year old spa in Tecate, Mexico that was founded and for many years co-owned by Deborah Szekely, the founder of the even more famous Golden Door. Despite cold and often rainy weather, the week was fantastic! In addition to splendid early morning mountain hikes, fitness classes and more spiritual classes (yoga, Feldenkreis, meditation, Tai-Chi), the Ranch offers remarkably good organic, mostly vegetarian (fish is offered three times a week) food. Most of the vegetables, even in winter, are grown in the Ranch’s magnificent six-acre organic garden and they taste remarkably like vegetables. The program is not as oriented as some to caloric intake but rather to eating only good, healthy food and not too much of it. The calorie contents of most breakfast and lunch items are marked, but you are on your own as to how much you eat. While not the focus of this post, the level of fitness and wellness instruction was almost without exception superb. The Ranch has recently opened a cooking school at a new facility next to the organic garden, where mostly vegetarian but somewhat less Spartan meals are prepared. I had three supposedly hands-on lessons, one with 20 students, one with only two and one with eight. The first was too crowded, and you were not able to get much of an overview of what the other students were producing. The second was heaven, just two students and the lovely chef, Ana Lorena Najar, with whom we ate the meal we and the sous-chefs had prepared. Eight was a great size, too, but the facility and staff can clearly handle several more; the chef thinks 12-14 is ideal. The food we prepared was uniformly delicious, and the recipe for nearly every item is contained in the beautiful new cookbook, "Cooking with the Seasons at Rancho la Puerta." Assorted fruits, hot cereals, cold cereals, yogurt, multi- or interesting-grain toast and bread, hard-cooked eggs, etc., with cooked eggs available on request. 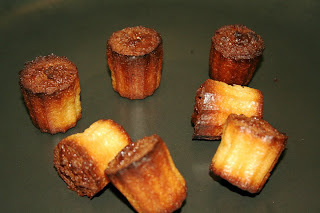 These are mini cannelés de Bordeaux (sometimes called cannelés bordelais). Easy to make and amazingly delicious. Cannelés are made by preparing a sweet batter, leaving it for 24 hours and then baking in a special mold in very high (later just high) heat. The idea is to get a crispy caramelized exterior and a soft middle. I prefer the mini version (about the size of your thumb) because the ratio of exterior to interior is greater, but you will find the full-size version (1-3/4" high by 2" across at the top) at most good patisseries in Paris. You really need a silicone pan to make these. Available on-line through Amazon.com and sometimes at Zabar's (at least the full-size versions). The following is a recipe adapted from Ateliers des Chefs, a French cooking school with numerous branches in Paris and elsewhere in France. 1. Bring the milk, the vanilla bean (split in two and the seeds scraped into the milk), the sugar and the butter to a boil. Let cool to room temperature. 2. Make a well with the flour and in the middle add the eggs. Mix with a fork while gradually incorporating the milk (straining out the pieces of vanilla bean). 3. Add the rum and let it rest in the fridge for at least 24 hours. 4. Pour into a squeeze bottle using a funnel. 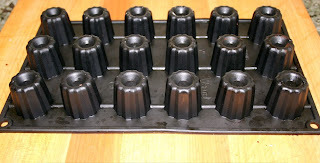 Place the soft cannelé molds on a half sheet or cookie pan. Then fill the cannelé molds nearly to the top. 5. Bake at 570 degrees (or as high as your oven will get) for 10 minutes. Then turn the oven down to 410 and bake for another 50 minutes or so. The tops should be very dark, a little burned is OK.
6. Remove from oven and allow them to cool to room temperature. Then turn over the silicone pan and they should fall out.